Life as a Hoosier is within reach. Get expert tips for keeping costs manageable. With our 5 Tips for Managing College Costs, you’ll learn how to identify financial opportunities, minimize your debt, and maximize your savings while you work toward a college degree. 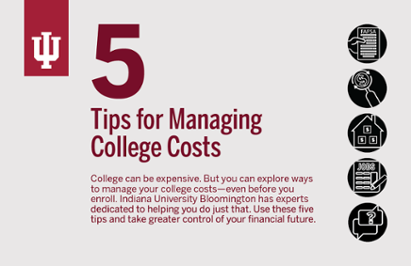 Fill out the form below to receive 5 Tips for Managing College Costs. At Indiana University, students can mix and match from hundreds of programs to fit their interests. Whether you’ve always known what you want to do or you’re still exploring, IU will guide you through your educational journey—and through your options for funding it.